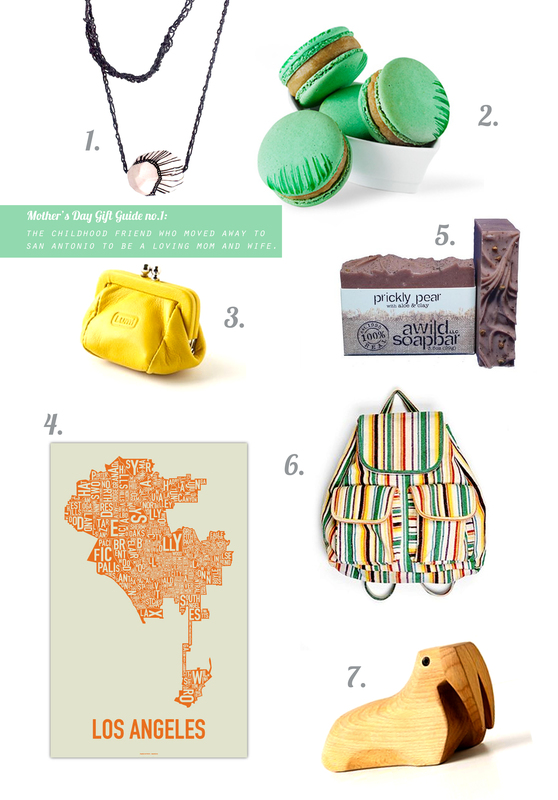 Mother’s Day Gift Guide no.1: The childhood friend who moved away to San Antonio to be a loving mom and wife. In honor of Mother’s Day, I’ll be posting gift ideas for the special mom’s in our lives this week. One of my oldest friends, moved to San Antonio a few years back. She’s since become a wife and mother and I miss her and her cute family dearly. Here are a few items that I think are perfect for a young momma like herself. Happy Mother’s Day Michelle! xoxo! 1. Beautiful GoldenInk Collaborative necklace for date night | 2. Delicious earl grey macaroons from Paulette because every woman (mom or not) needs to indulge sometimes | 3. Lumi coin purse so you’re always ready for the popsicle man | 4. Ork Los Angeles poster to remember home | 5. Prickly Pear natural soap to wash away the mommy germs | 6. Ecote Baja Bag to keep baby stuff packed away cute | 7. Aivik Trinket Box for all of your mommy treasures. There’s not a day that I don’t admire that Los Angeles poster you sent me. Thank you so much. Love the blog Paola!